This type of deployment is recommended for a production environment. When high availability is needed and when there are many concurrent users (this number depends on each product: AccountingIntegrator, Datastore or InterPlay), then a cluster deployment is recommended. Note AI Suite Infrastructure services are used by all AI Suite products: AccountingIntegrator, Datastore or InterPlay. The following sections describe the elements involved in this type of deployment. AI Suite Infrastructure server is a computer where AI Suite applications are installed and run. 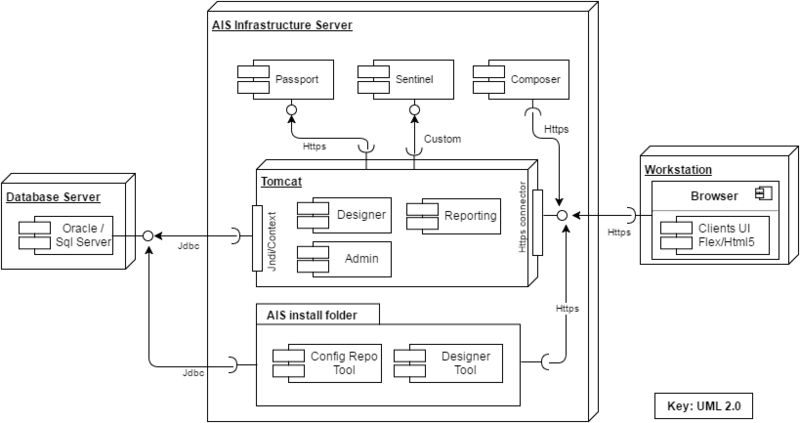 AI Suite Infrastructure delivers its own preconfigured Tomcat where AI Suite Infrastructure Web applications are installed and run. Designer – web application that is used to define the business configuration for AI Suite products/components. The Designer web application provides services for its clients using either AMF protocol or Web Services. Designer is optional for production environment. Report Server – web application that is used to generate default report templates and to manage reports: generate, list, view, delete. This application does not have a user interface; it provides a REST API that is used by other AI Suite components. Communication between the Report Server application and AI Suite components is done using REST calls, JSON format over HTTPS connection. Administration – web application that is used to manage the settings of different AI Suite components and to visualize information about AI Suite data flow at runtime. The Administration web application provides REST services and JSON format. PassPort: PassPort is a web application that runs in its own embedded Jetty server. Each AI Suite component/product communicates with PassPort to check authorization and access rights. The protocol used for communication it is a custom protocol, XML exchange, over HTTPS. For details about PassPort architecture see the PassPort documentation. Sentinel: Sentinel is a web application that runs in its own Tomcat server. AI Suite components/products communicate withSentinel to send technical audit information. The protocol used for communication is a custom protocol that uses a socket connection. For details about Sentinel architecture, see the Sentinel documentation. Composer: Composer is a web application that runs in its own embedded Jetty server. Composer is used to define the business configuration (structure and rules) for AI Suite components/products. For details about Composer architecture, see the Composer documentation. Repository Tool – command line application used to manage the runtime configuration used by all AI Suite components. The Repository command tool connects to the database application server through JDBC over a socket connection. Designer Tool – batch application that is used to execute different Designer services. The Designer tool connects to the database application server through JDBC over a socket connection and to the Designer web application through Web Services and XML over HTTPS. The Rule Engine Server Web application runs in its own embedded Jetty server. Rule Engine Server uses Rule Engine runtimes to execute accounting rules. Rule Engine Server communicates with other AI Suite products/components (Datastore, Report Server, InterPlay) using REST calls over HTTPS. The Rule Engine installation folder contains the Rule Engine's runtime libraries and scripts. The Rule Engine installation is used by Rule Engine Server to create Rule Engine runtimes, to configure them and to process financial input events by applying accounting rules. For information on the PassPort, Sentinel and Composer clients, see each product documentation. A database server is a computer where a database application server such as Oracle Database or Microsoft SQL Server, is installed and run. AI Suite Web applications and command line tools connect to the database application server through JDBC. The following table displays the communication channels between different components: the default port and the type of communication between the component that initiates the request (rows) and the target component (columns).